The following is a list of the ten smallest metro area population cities in the United States that have a major professional sports teams. A major professional sports team means a team from the NFL, the NBA, the NHL or MLB. Just because a team plays in a small city does not mean that the team cannot be successful and worth a lot of money. The team that plays in the smallest city that has a pro sports team has won 15 championships and is worth over $2 billion. 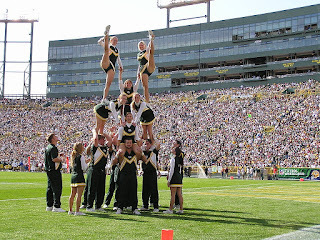 Green Bay, Wisconsin is the smallest city in the United States to have a major professional sports team. The Green Bay Packers play at Lambeau Field in Green Bay, a city that has a metro area population of just 305,000 people. 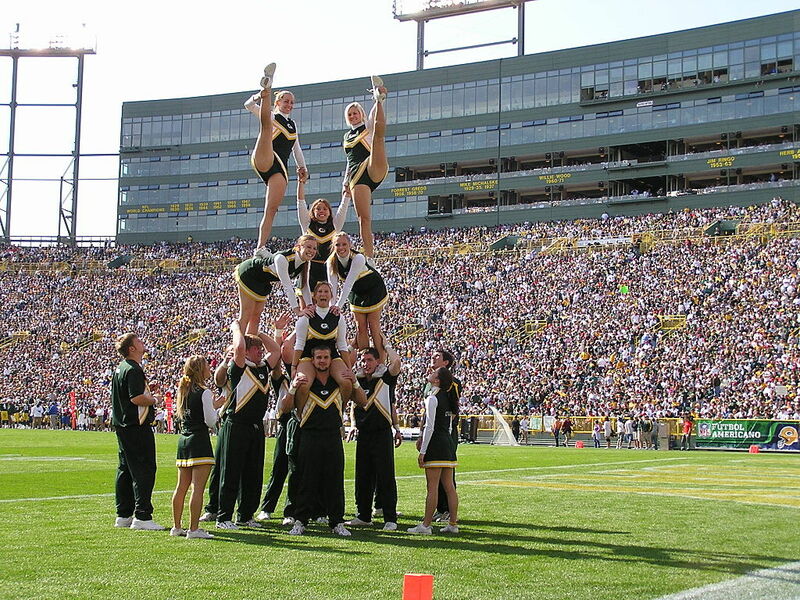 The photo above shows Green Bay Packers cheerleaders at Lambeau Field in action. The Utah Jazz of the NBA play in Salt Lake City, which has a metro area population of 1.124 million. That makes Salt Lake City the second smallest city in the United States to have a major pro sports team. The Raleigh metro area has a population of 1.131 million people, ad the city is home to the Carolina Hurricanes of the NHL. Buffalo is the first city on the list with two professional sports teams. Both the Buffalo Bills of the NFL and the Buffalo Sabres of NHL are in Buffalo, which has a metro area population of 1.136 million people. New Orleans also has two sports teams. The newly named New Orleans Pelicans of the NBA, and the New Orleans Saints of the NFL play in the Big Easy, which has a metro area population of 1.168 million people. Just the Oklahoma City Thunder of the NBA call the capital city of Oklahoma City, Oklahoma home. Could Oklahoma City support a NFL franchise? Memphis, which has a metro area population of 1.316 million people, is home to the Memphis Grizzlies of the NBA. At least for now, the Jacksonville metro area with a population of 1.346 million people is home to the Jacksonville Jaguars of the NFL. The Jaguars have a tough time selling tickets in Jacksonville, and the team has been rumored to move to places like London in the last few years. Milwaukee, which is a great sports town, is home to both the Milwaukee Bucks of the NBA and the Milwaukee Brewers of MLB. Milwaukee is also very supportive of the Marquette Golden Eagles in college basketball. The capital city of Nashville, Tennessee is home to both the Tennessee Titans of the NFL, and the Nashville Predators of the NHL.